The weather here in Colorado causes a lot of snow. Most roofs have snow guards installed on them already, but not all of them have the most efficient snow guards. Our state of the art snow guards are designed to keep all of your snow on your roof instead of piling up on top of your gutters, but still keep shoveling snow off of your roof an easy task. Snow blockers help to prevent accidents or injuries from home avalanches, as well as adding extra gutter protection and preventing the gutter system from breaking under pressure of snow build-up. Snow guards for roofs are essential for all Colorado homes and businesses. Not only will it save you money in gutter repairs, but could also potentially save a life. Longmont Gutters offers fast and efficient snow guard installation on your roof. Our service is affordable and is sure to provide you with the necessary gutter protection and ease of roof cleaning. Although snow blockers are usually installed for functionality, many of our customers also take advantage of the appeal roof snow guards can add to your home’s exterior. We use clear, plastic snow blockers to maximize your homes appeal and use the sleek look to keep your house modernized and fitting in with its surroundings. Depending on the material, slope, and size of your roof. The placement of the snow guards varies. Our snow guard installers are well-trained to analyze your roof’s dimensions and perfectly place the snow blockers in a pattern that will optimize your roof’s ability to maintain a hold on snow. With professional snow guard installation equipment, our roof and gutter technicians can properly install your new snow blockers and make your home safe and your gutters protected during the winter. For residential metal roofs and most business’ roofs, snow guards are important to have installed. Snow guards for metal roofs ensure employee and resident safety and, again, gutter protection. Snow also serves as a great insulator, which is a characteristic most people make use of by keeping snow on their roofs through the use of snow blockers. This is more difficult with metal roofs, since metal serves as a heat conductor, which means the heat from inside your home warms the metal roof. As the metal roof heats up it will begin melting the snow, causing your roof to become slick. Metal roof snow guards are designed to keep snow on your roof even during the snow’s melting process, which is when it usually breaks apart and avalanches from your roof. Snow guards for metal roofs are specially installed in the optimal pattern to ensure snow stays on your roof and off of your gutters and ground for the longest possible time. 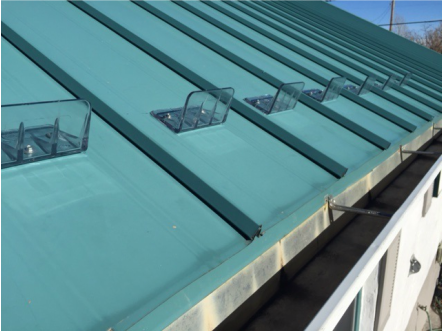 Longmont Gutters offers our amazingly fast snow guard installation for metal roofs for both residential and commercial buildings. If you are living in Colorado, chances are you’ve had to deal with snow avalanches from your roof, and you’ve probably had your gutter system collapse before. Snow guards are designed to mitigate those issues as best as they can and keep your home insulated from the cold weather.